GOODGOD Small Club ~ JOYRIDE EP LAUNCH! One of Sydney’s favourite DJs, musicians and straight-up personalities has finally launched his debut EP, and he’s launching it in the Danceteria! 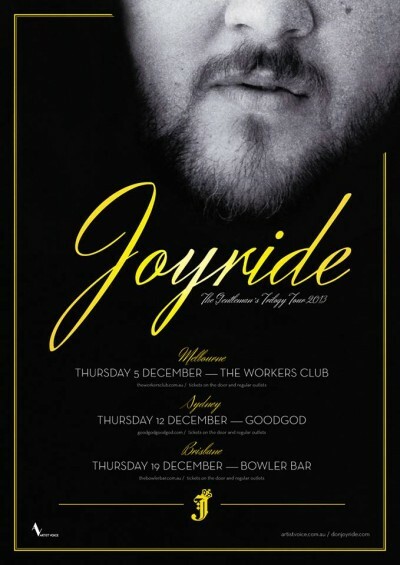 From DJing clubs and festivals around Australia, to hosting FBi Radio‘s hip hop show, The Drop, to his involvement in countless musical projects (Spit Syndicate, Winterpeople, Horrorshow and many others), Joyride is a cross-genre local legend. And now, he’s stepping out with a run of soulful solo EPs. So come on down to the Danceteria on December the 12th and show Joyride some love!